Along with a pretty decent tan, something else I’ve bought back with me from my trip to Egypt is a slightly slimmer me. I’ve shedded a few pounds, probably due to all that sweating in 40+ degree heat and I’m happy to say it’s given me the kick start I’ve been needing to getting a little bit healthier. with mum lifestyle choices. Since being back I’ve been saying no to the biscuits and thinking twice before scoffing down endless chocolate but the one thing I’ve really struggled with is fizzy drink. I’ve tried and tried but fizzy drink is just something I can’t seem to give up. The thing is, I don’t drink it on it’s own, always with a meal and I don’t ever finish a can, however I just need a few gulps before I feel completely satisfied with my meal. It’s been an ongoing battle for years but I’ve just come to accept that fizzy drinks, Irn Bru especially are my guilty pleasure and my downfall. So when The Juice Shed Company got in touch with me I had to of course accept their offer to try out their revolutionary product. 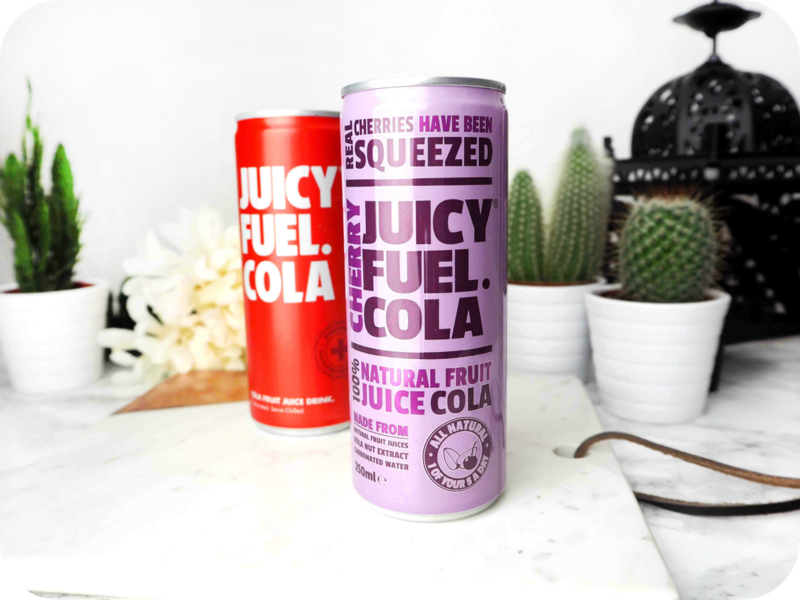 Juicy Fuel Cola is marketed as a fizzy drink that is one of your 5 a day. It’s 100% natural with no preservatives and no added sugar so it’s completely natural. Cola that isn’t entirely bad for you? Surely not?? The Juice Shed Company very kindly sent me a few cans of their original cola flavour and cherry flavour to taste. I must admit I was a little apprehensive. Starting with the original cola flavour, I stuck them in the fridge ready for my next meal. As with most drinks, they advise that you serve the drink chilled. I have to say I was pleasantly surprised. The taste doesn’t differ from coca cola at all. I was convinced that there would at least be an after taste and actually there isn’t one. One thing I did notice is that whenever I drink coke, my teeth feel like they have a weird coating on them that makes me feel like I need to brush them as soon as possible. 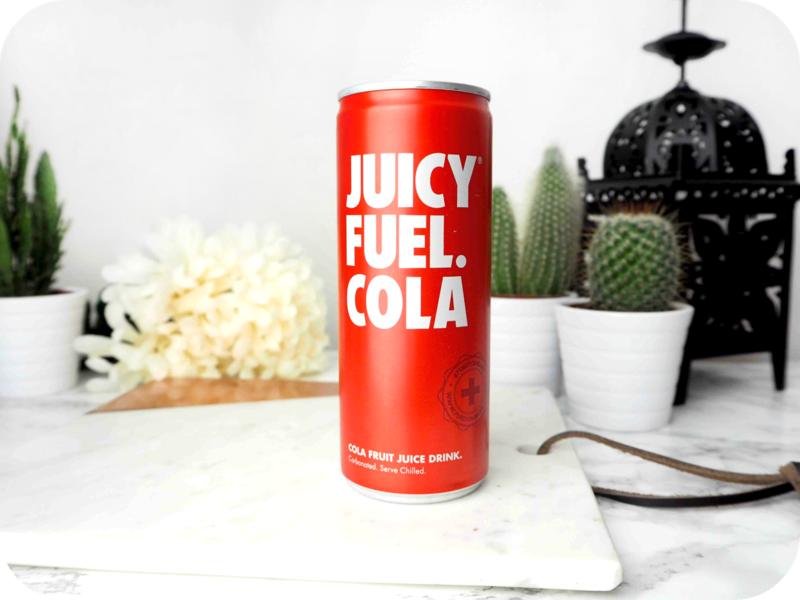 It’s probably the insane amount of sugar or other additives in it but with Juicy Fuel Cola, there was no weirdness about it at all. The drink doesn’t go flat very quickly and best of all it’s only 50 calories per 100ml! The second flavour I tried was cherry cola which tastes like a cross between Dr Pepper and Pepsi Max Cherry Cola. I love both of those so this one was definitely a hit with me too. In all honesty I struggled to find anything wrong with these drinks at all and can see them being a big hit in the very near future.